NYCDOT and NYCDDC are showing constructed granite cobble mock-ups at Pier 6 as part of a plan to reconstruct Vinegar Hill and DUMBO historic streets. DUMBO — The Department of Transporation is giving new meaning to the term "stonewashed." Engineers and designers from DOT and the Dept. 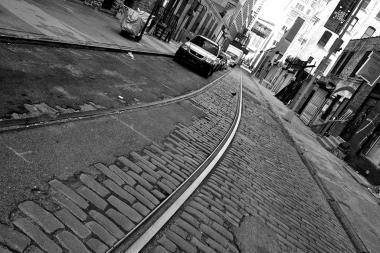 of Design and Construction are set to present their artifically-aged "granite cobble mock-ups" that could be used to replace Belgian blocks on some of DUMBO and Vinegar Hill's historic streets. "NYCDOT and NYCDDC invite you to preview and comment on their plans for reconstructing DUMBO and Vinegar Hill’s historic streets," wrote the DUMBO Improvement District on their blog. "The test-streets will be on view to the public and DOT will be on hand to take your feedback on the design and stones." The DOT's plan to replace Belgian Blocks with new stones will make the streets more accessible to people with disabilities and pave the way for the Brooklyn Waterfront Greenway, a proposed 14-mile bike lane along the Brooklyn waterfront from Greenpoint to Bay Ridge. The plot has drawn criticism from locals who say that mass produced stones are incompatible with the historic character of the neighborhood. Two petitions against the project have surfaced asking the city to "preserve the unique charm and history of Vinegar Hill. "Save what soul is left of New York City, not willfully and callously destroy it," wrote online petitioner Malia Jensen. But DOT is hoping that the new stones, made with a "mix of original and new cobblestone" will be aesthetically pleasing to the community. The project will “restore the street’s historical elegance while removing stumbling blocks for the thousands of people walking and biking in the neighborhood daily,” Janette Sadik-Khan, the transportation commissioner, said in a statement. The mock-ups will be display at Pier 6 beginning July 1. Visit the DUMBO DID's website for a full viewing schedule. Any feedback on the mock-ups can be sent to plazas@dot.nyc.gov.